Paintings, Prints and Pottery. Observing nature and making stuff. 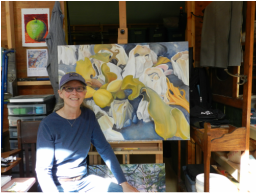 Kathleen paints coastal landscapes of her home in Tenakee Springs, Alaska and desert landscapes of the North American Southwest. Her pottery vessels merge historical methods of working the clay and classical pottery forms, with modern imagery inspired by the flora and fauna surrounding her home. Kathleen's work moves beyond the surface as she expresses the soul of the lands she loves. Join her on her journey of artistic exploration. Enjoy! Kathleen says: "I enjoy working in a variety of media, both two and three-dimensional. Much of my work is based upon close and direct observation of the natural world with an emphasis on the abstract designs found there. I am fortunate to be able to split my time between Tenakee Springs, Alaska and Arivaca, Arizona. Each region has spectacular scenery to inspire and invigorate my creative spirit." Please visit my on-line galleries for more images. To schedule a personal visit to my studio, my contact page has maps as well as phone and email contacts. I would love to hear from you!